One of Orfit Industries worldwide customers is the National Center of Oncology in Baku, Azerbaijan. They use a wide range of Orfit Immobilization devices during radiation therapy treatments. The NCO team has developed an abdominal compression mechanism by combining various Orfit products. They position their patients on the MammoRx Breast Board, with the arms lifted above the head. 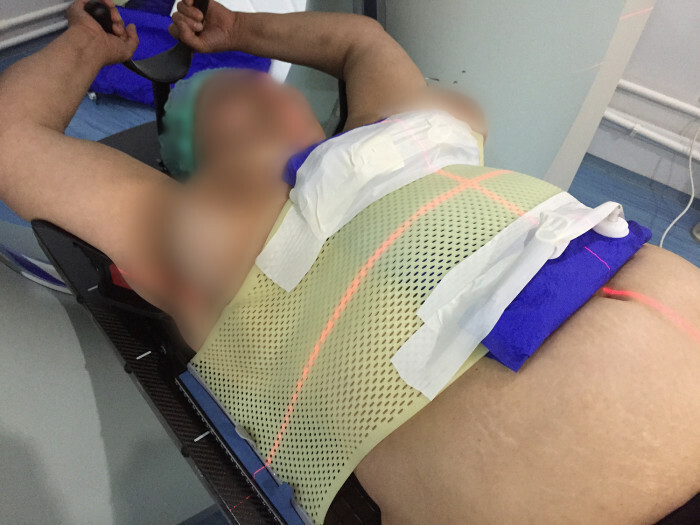 Once the patient is positioned correctly, they make a 2-points Efficast breast mask over the upper abdomen. When the mask has hardened out completely, they place a small vacuum bag underneath the mask. The vacuum bag is placed between the mask and the patient. The combination of the vacuum bag and the mask form an abdominal compression mechanism that restricts the breathing of the patient. The solution that NCO developed is a good solution for those hospitals that already have a MammoRx Breast Board. For hospitals that don’t, Orfit offers standardized abdominal compression devices as well.